Investigators have studied the growth of children with cleft lip and palate (CLP). However, there continues to be controversy whether children with isolated clefts attain normal growth or do in fact show different growth patterns as compared to typical children. Children with cleft-lip palate have difficulty to be breast and bottle fed due to the lack of intra-oral negative pressure, which is necessary for efficient sucking. They often present chocking, nasal obstruction, non-coordination of sucking with respiration and swallowing, prolonged feeding time, and their parents feel insecure to feed them. The reduced volume of ingested milk may lead to failure to thrive. The link between the oral and the nasal cavity in children with cleft palate may cause frequent airway infections and middle ear disease. The feeding difficulty and the higher frequency of infections are environmental factor that impairs physical growth of children with cleft palate in the first year of age. According to many studies, children with cleft palate, associated or not with cleft lip, show impairment in their length and weight growth in relation to children with isolated cleft lip. They are also smaller and lighter than the control subjects, mainly during the first year of age but a catch-up growth may occur later in childhood. A large 10-year longitudinal and prospective study showed that children with unilateral cleft-lip palate did not present any growth impairment from 2 to 10 years of age as compared with normal children. 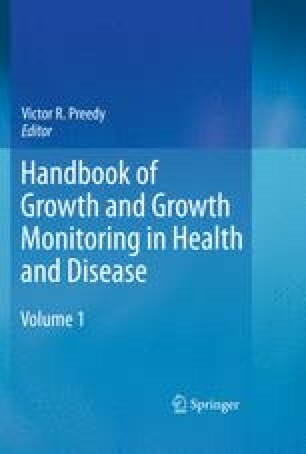 The growth curves established in this study can be used along with reference curves to monitor the growth of children with UCLP from 2 to 10 years of age. I wish to acknowledge Arshad R. Muzaffar, Editor of The Cleft Palate Craniofacial Journal, Valerie Pierce, Publishing Coordinator of Allen Press Publishing Services, who granted permission rights for the original publication, Ana A. Gomes Grigolli, Librarian at Hospital de Reabilitação de Anomalias Craniofaciais – Universidade de São Paulo (HRAC-USP), Ricardo Pimentel Nogueira, Documentation and Information Technician at HRAC-USP, Lucas Ribeiro de Aguiar, Designer Assistant, and Elaine de Oliveira Martins, English teacher for their support and cooperation on the accomplishment of this chapter.